Locals say the company has been trying to cover up the evidence and switched to operating at night following complaints. A petroleum company has been caught red-handed dumping untreated waste in a protected forest on the outskirts of Hanoi. Residents of Soc Son District started noticing lines of trucks queuing up to dump tons of waste shortly before the Lunar New Year (Tet). A foul, putrid odor has since been hanging over the area and disrupting daily life, locals reported. 34-year-old Nguyen Van Thu from Soc Son said that excavators arrived just before the Tet festival to dig giant pits and flatten the ground to allow the trucks access. When asked, workers said they would be dumping “organic soil” into the pits for new plantations, but by February 23, hundreds of trucks had dumped tons of non-organic trash, including plastic bags, in the area. “There was nothing to cover it [the waste]. The company only brought in nylon coverings and erected metal roofs to conceal the waste after we complained. They were trying to hide the evidence,” Thu told So Huu Tri Tue magazine. An official from Hanoi’s Department of Agriculture and Rural Development named the company responsible as Hung Phat Petroleum Limited Company. The company was supposed to separate trash from the organic waste before dumping the latter, but did not comply with regulations. “The Protected Forest Management Department and locals have demanded that the dumping stop, but they’ve just started operating at night instead,” the official said. The official added that the waste had come from a construction site. Soc Son’s People’s Committee has since demanded those responsible to resolve the issue and remove the offending waste before Thursday. 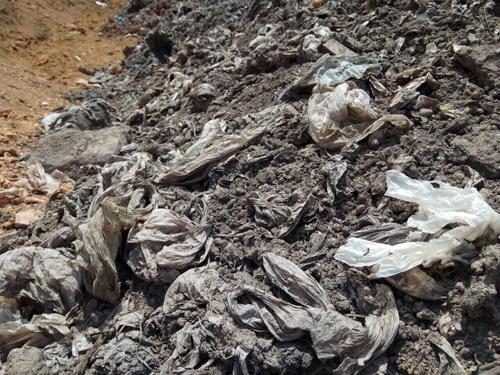 Waste treatment is a hotly debated topic in Vietnam. Just last year, a steel production unit belonging to the Taiwan-based Formosa Group was punished for failing to separate toxic waste before dumping it at sea, and instead hiring a local company to do the job. The company was fined VND560 million ($24,640) and paid the affected provinces $500 million in compensation, according to the Vietnamese government.